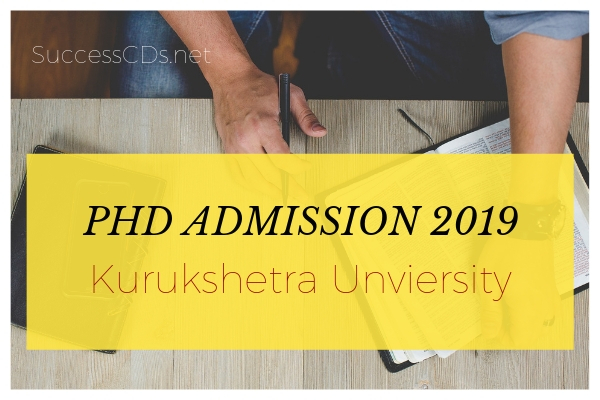 Kurukshetra University PhD Admission 2019 - Kurukshetra University, Kurukshetra invites application forms from the eligible candidates for admission into PhD Course for the academic year 2019. Selection is based on Entrance Test in the concerned Departments /Institute. Those selected have to get enrolled in March 2019. For admission to PhD Courses through Entrance Test for the Academic Session 2019 are invited from the eligible candidates to be enrolled in March 2019. Application Form is to be submitted to the concerned Chairperson/Director of the Department/Institute at University Campus latest by 10th January 2019. These Regulations shall be called Minimum Standards and Procedure for Award of PhD Degrees Regulations 2016 of Kurukshetra University. Candidates must be Master’s Degree with 55% marks OR M.Phil. Degree with 55% marks and also having secured 55% marks in Master’s Degree in the main subject (or an exam recognized as equivalent thereto)/allied subject (or an exam recognized as equivalent thereto) OR its equivalent grade 'B' in the UGC 7-point scale (or an equivalent grade in a point scale wherever grading system is followed, calculations of marks as per CBCS pattern). A relaxation of 5% marks of 55% marks (2.75%) i.e. from 55% to 52.25% marks in the aforesaid Degrees is allowed for those candidates belonging to SC/ST/ Differently Abled (non-creamy layer) of Haryana. Candidates possessing Degree equivalent to Master’s Degree/M.Phil. Degree equivalent to Kurukshetra University, Kurukshetra from a Foreign Educational Institution accredited by an Assessment and Accreditation Agency which is approved, recognized or authorized by an authority, established or incorporated under a law in its home country or any other statutory authority in that country for the purpose of assessing, accrediting or assuring quality and standards of educational institutions shall be eligible. Their admissions shall also be governed by the rules applicable for the International students of the Kurukshetra University. For calculating percentage of marks for Master’s Degree in the case of Education and Library & Information Science, marks obtained in B.Ed. + M.Ed. (Each one Year Course) and B.Lib.Sc. + M.Lib.Sc. (Each one-year course) shall be halved (in old cases, if any). Kurukshetra University shall notify predetermined total seats to be filled up by each Dept./Institute on annual basis primarily for UGC/CSIR-NET JRF (with validity period) candidates and remaining vacant seats through Entrance Test. UGC/CSIR-NET JRF (with validity period) is eligible to submit the Application Form duly filled in all respects for admission in PhD Course under Exempted Category, if otherwise eligible. UGC/CSIR-NET JRF (with validity period) shall be directly admitted in PhD Course under Exempted Category subject to fulfilment of other conditions as laid down in the PhD Ordinance. PhD Course shall be for a minimum duration of 3 years including coursework and a maximum of 6 years. Every research scholar shall submit his/her thesis within a period of 6 years from the date of his/her enrolment for PhD Course, but not before 3 years including coursework. Kurukshetra University shall hold the Entrance Test of main subject and allied subject as per schedule notified every year, subject to availability of vacant seats in that subject. Candidates including UGC/CSIR-NET JRF applying in allied subjects or an exam recognized as equivalent thereto shall be required to appear in the Entrance Test. A Committee consisting of the concerned Chairperson/Director of the Dept./ Institute (Coordinator of the test) and the Controller of Exams will conduct the PhD Entrance Test. Exam of Paper-I & Paper-II will be held as per schedule notified by the University. Distribution of Question Papers, Marks and Duration. Syllabi for entrance test duly approved by the Departmental Research Advisory Committee of the concerned Department/Institute will be placed on the website of University. The medium of examination shall be English/Hindi only, except in the examination for languages other than English. The reservation shall be applicable for admission in Ph.D. course to eligible JRF (with validity period) candidates and those candidates who appeared in Entrance Test as per State reservation policy and the instructions issued from time to time by the Govt. of Haryana while preparing the merit list. Each Department/Institute of Kurukshetra University will maintain the roster of reservation of seats category-wise in fraction in Roster Register. Eligible candidates are invited to submit Application Forms for admission to various PhD Courses through Entrance Test in the concerned Department/Institute upto 10th January 2019 PhD Ordinance, Application Form, Schedule, Fee Structure and No. of vacant seats(category-wise) in each Dept. /Institute are available on University website www.kuk.ac.in.